Ok, I was able to eek out yet one more BLT this season. I really like really good flavorful BLTs. When I was younger, I thought I hated BLTs because the tomatoes available to me from conventional groceries were terrible. They were mealy, tasteless, dry, and all around icky. 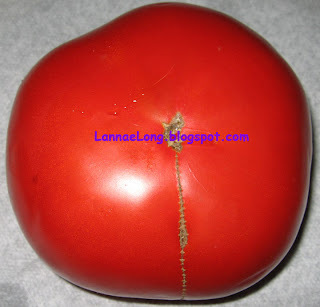 How can a tomato be dry, but that is what was sold all through the '80s and '90s where I used to live. 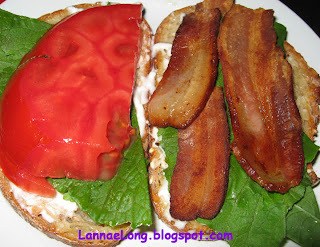 The reality is that I really love the BLT, as long as the base ingredients are delicious! In my opinion, the pivotal player in the BLT is the tomato followed by the bread. 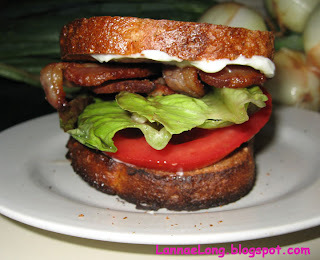 This Bacon Lettuce and Tomato sandwich was made with really delicious, locally made ingredients. I must say, I am addicted to local foods. Everything tastes so much better than that stuff from the big box grocery store. Two weeks ago, I was out of town and could not get local veggies because there was no farmers market that I knew of. So, I went to the salad bar of a big box grocery store and got a big box of salad for the next couple of days. That lettuce was like cardboard, the carrot shreds were like little cardboard sticks, the cabbage, you got it, it was like squares of cardboard. I gutted through some of it, but I was not happy with this $7.99/lb cardboard salad. I was missing my local organic veggies. Anyway, back to my last BLT. 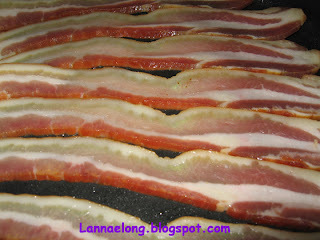 Here is the Bacon. I cooked it up nice and crispy. Here is the lettuce I used. Actually, it was purple mustard green which added a nice peppery wasabi flavor to my sandwich. And last but not least, the tomato. I am addicted to local ingredients. It is an addiction that I can live with. Here in Nashville, we has the start of a lovely spring in the beginning of March, and I thought we were going to have a great spring. It was no longer freezing over night, and then in April, WHAM! The deep freeze came in and ruined all the early strawberry crops, killed trees that already were in bloom, and killed back a lot of shrubs. Because of the freeze, the strawberry season was only 2 weeks, and then there were no strawberries to be had besides Driscolls. sigh. Then we had the long dry drought that lasted until last week. The drought had really made me appreciate what local farmers are going through as they watch their crops not grow due to lack of water. The surrounding rural counties have "no burn" orders because the is a risk of starting an uncontrolled fire. My grass has not been mowed in 3 weeks because there has been so little rain, and the grass has not grown. The drought was killing the 2nd round of berries, blackberries and raspberries. The season for these gems is about one week this year. I have had to go outside the local 100-mile limit for fruit because the growning conditions this year have been so hard. I have been supplementing with bananas which are good for exercisers and potassium. It is also good for people to attract mosquito bites. I would prefer to eat only local fruit this summer, but there just isn't the rain and conditions that would make a fruitful bounty. I was only able to get the wild blackberries by contacting Bramble Hill Farms earlier in the week, and asking for them to hold a pint for me, and I promised to be there early to buy them. 2 weekends ago, the berries had a very complex and sweet and tart flavor with a slight bitterness to it. They were the perfect berries that lasted 4 days of rationing. This past weekend, I was lucky to buy yet one more pint, but they were more ripe and sweeter and they needed to be eating with 2 days due to the ripeness. 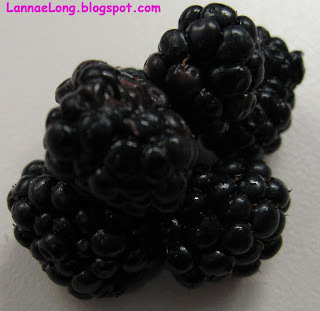 I was so sad to have eaten the lasts of the ripe blackberries yesterday, and I look longingly at the photo about the scrumptious goodness. I know I will have to wait a year for these treasures again. Then today, to my good fortune, my friend walked over with a pinkish-red clear plastic box with a clear plastic bag over it. As she walked closer, I could see it was RASPBERRIES! Oh dear, my thoughts went into sweet berry overdrive. She has a couple raspberry bushes in her back yard, but they too took a drought hit, and bird love the berries. Last year, she shared 2 quarts, but this year only 1 pint. The reason for the low volume this year is because of the drought. I know she is being very generous with sharing with me, and her raspberry bushes are just not yielding the fruit this year like they did last year. 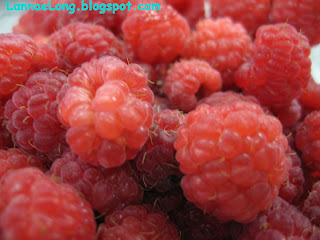 I am savoring every single last rasp as I eat each one slowly. I don't want to share these as they are sweet treasures. As I continue with my local eating habits, I understand so much more about how a day of rain or no rain can make the difference between only one pint of fruit to 4 pints of fruit. Because all the local berries plants are lacking production this year, I value berries so much more. I also look forward to next year in hopes of better growning conditions, and long berries' seasons. Until then, I can only look at these 2 photos as a reminder of the few days I enjoyed the berries. Every since I saw Cookiecrumb's post on a BLT aka Not a Cheese Sandwich, I have been waiting for all the local planets to align, so that all the ingredients I need to make the ultimate locally made BLT would be fresh and available. This is very difficult because lettuce is a cool spring and fall crop, and too much heat and sun puts lettuce out to dry, and tomatoes are a summer fruit, and they are just now getting to market. Back in the day when people grew their own food, there would be a short spring overlap of lettuce and tomato havesting, but not some years, and an LT anything wasn't really going to happen in the spring. I also had to wait for my favorite local bacon maker, Mr. Scott (not to be confused with Mr. Scott or Scottie from Star Trek), to slaughter a few pigs, and salt cure and hickory smoke the pig belly to make bacon. Then, all the spring time BLT planets aligned and the local BLT was going to happen. 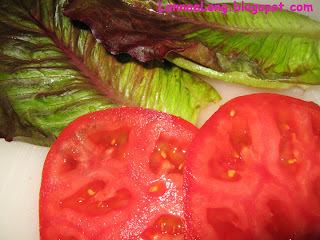 Last week, I saw tomatoes, granted they were hot house, from Clarksville, 50 miles from my home at the Produce Place. I love the Produce Place because they are a local and organic conscious market, and they label everything with its place of origin. I bought 2 tomatoes and used one for my BLT. The other one, it is still on my counter, ready to eat. Not one blemish because it has been handled gently by me, and it is local. 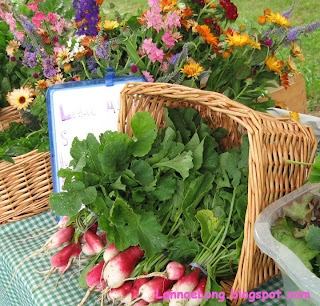 Local food lasts longer. The lettuce, I got on May 26, at the Franklin Farmer's Market from the Hungry Gnome Farms booth. Bert, one of the partner's in Hungry Gnome, told me that he cut the head of lettuce that morning, and that was the only whole head left. The rest they were selling as salad mix, pre-cut leaf lettuce. I took the head of lettuce, knowing very well I had some back to back personal and business trips out of town, and I would probably end up composting it. But, I always like having leafy greens to work with at all times, so I took it. When I got home, took a damp paper towel (not dripping, just damp) loosely wrapped the lettuce in it, loosely covered it with a plastic bag, and stuck it into my veggie bin in the fridge. This is how I store fresh herbs, and it seems to make herbs last longer. So, 3 weeks went on, I was home for day here and there to do laundry and get ready to the next destination, I started pulling leafs off for small salads. This is still the same lettuce, crisp and green and ready for me to eat on June 16, 3 weeks later. I finally finished off the head of lettuce on June 21, 26 days after Bert first cut the head of lettuce to sell. I am telling you, local lasts longer, and in the end, saves money and time. The bacon from Scott Hams, is quite possibly the best bacon I have ever had. It is brownish in color because red dye is not pumped in. There is really hickory smoke aroma coming off the package because they really do use a lot of hickory wood to smoke the heck out of the bacon. The slices are thick, so you know exactly when you are eating a slice of bacon. I had to wait until the 2nd week of June, after the pig slaughter, salt cure and smoking of the bacon before I could buy another pound of the bacon. It has been 2 months since I first bought Scott's bacon, and it was worth the wait. I am not sure if I can eat any other industrial fake flavor inject bacon ever again. The bread, I got from Provence Breads, the local bread baker in town. Terry, a transplant from the San Francisco Bay area (thank goodness, thank you Terry) owns and bakes the best bread in Nashville. Terry is a bit like the Harlan County Chinese food place, as Terry is the ONE and ONLY artisan bread maker in Nashville. Terry could have been one amongst many in the Northwest, but found a need and niche in Nashville. Granted the base ingredients are not from 100-miles of Nashville, but at least the bakery and Terry are local. 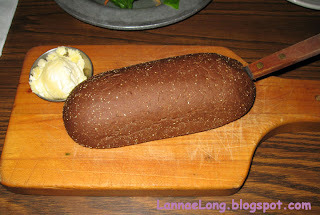 I got 2 slices of the multi-grain wheat bread, toasted it up and used the slices for my bread. The mayo situation, I just used the blue lid stuff. I contemplated making my own out of a local egg and bacon fat, but I was on a time crunch trying to eat lunch and get ready to attend a wedding. The mayo was not local... so what. I gotta draw the line somewhere. Anyway, the BLT was the best I have ever had. 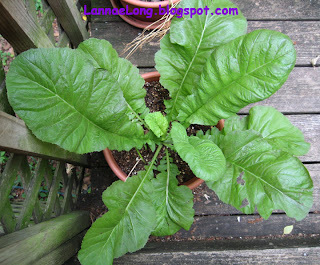 I cannot have a local BLT again until the fall when lettuce is available again. Until then, I look fondly at my photo of my BLT that was SO GOOD! Autumn, hurry. Panda Garden in most any other town would not be a "find", but here in Harlan it is. There is a lack of non-fast food restaurants in Harlan because there is not a market for that type of restaurant. 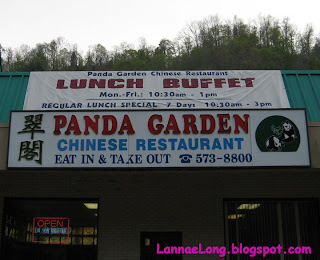 Harlan has fast food, McDs, Taco Bell, Rax, and KFC , and then it has Panda Garden. I eat most of my dinners at Panda Garden because they serve fresh veggies. 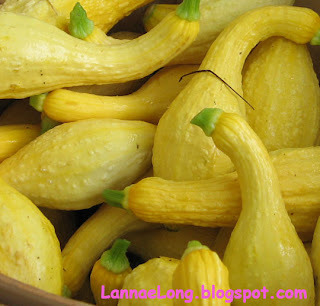 They may be the simple like broccoli, carrots, snowpeas, onions and zucchini, but they are fresh. Everytime I went in, there is a white woman who waits tables who is deaf, but can read lips. She has been there for a few years. She always gets the drink orders right, and is a friendly constant. I noticed the kitchen staff look Asian, and was a surprise to me. There are virtually no Asian people in Harlan County except for the families that run this restaurant. 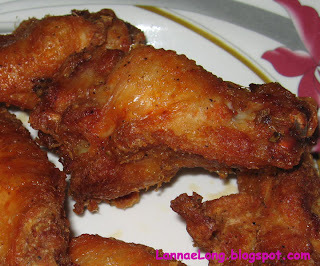 I put my order in, and I will admit that I love chicken wings, buffalo wings, wings in gravy, wings on the grill, most any chicken wing cooked up. I had to order some fried chicken wings. The young woman who took my order is Chinese, and is just a charming spirit. 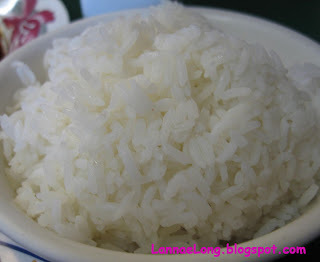 I ordered some white rice because that is what you eat with Chinese food. There was brown rice on the menu, but they don't have brown rice much anymore because there is not a market for it in Harlan County. I also ordered my entree, a spicy seafood stir fry. 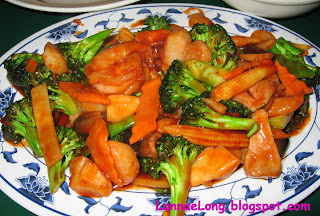 It was packed with fresh carrots, broccoli and full of huge shrimp and scallops. This was a luxurious dish for less than $10. Amazing! Next time I may ask for less spicy sweet sauce, and then it will an amazingly healthy and tasty dish. So I pulled the young lady at the register aside, and her name is Joyce. She is Chinese and orginially from New York City. Her cousins, about 14 years ago, were trying to find a shortcut to Florida, and took the KY state highway 421, not knowing the mountainous and tretcherous winding paths they were going to be on, and it really wasn't a shortcut. By this route, they found the town of Harlan in Harlan County, and notice not one Chinese restaurant. On the way back, they found a vacancy in a strip mall with reasonable rent, and Panda Garden was born. The two cousins tried running the restaurant themselves, and figured out that it was exhausting, so they sent a message up to Joyce and her boyfriend in New York, that they could get a steady paycheck if they came to Harlan, Kentucky to help run the restaurant. So they did. What Joyce found was that some people would just walk into the restaurant because they never had seen a Chinese person in real life. Sometimes they came back to try tasting the food too because they never had Chinese food either. For the most part, the town folks were curious, welcoming and then got used to the Chinese restaurant owners as any other Harlan resident. I asked Joyce how she likes it in Harlan compared to New York. She said that they have a good quality of life, she married her boyfriend and have 4 lovely kids, and they own a house. In New York, they could not afford to do that. Joyce said she has so much more in Harlan because the cost of living is so much less than New York. She said that they learn to have fun together as a family rather then always going out like in New York. Joyce also said that there are a few personal services in Harlan, but no spa, massage or facials, etc, and her next business she is going to try is to start a mini-spa in town. She wants people to enjoy the luxury of a mini-spa day, like the women in New York. I wish her luck and it was fun to get some of the back story of the only Chinese restaurant in Harlan County, Kentucky. 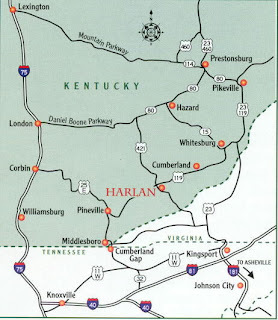 The uppermost city (town) in Harlan County is the City of Cumberland. It is really in the middle of Appalachia and coal country. The town is also in the middle of almost no where. I don't get cell phone service, and I don't get wireless service there. There isn't a gym, but there is satellite TV. 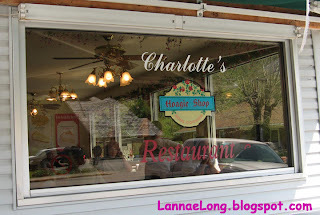 The one little bright spot of sunshine in dining arena in Cumberland is Charlotte's Restaurant. I wouldn't say that Charlotte's is great because it doesn't serve homemade pies, rather it has a bunch of single packages of Sara Lee pies. Much of the food is food service stuff, but at least it is not fast food. The lack of fresh food is not just Charlotte's problem, it is a problem for the county itself. The region is mountainous, and I don't see much of the area being used for farm land, rather it is used for coal mining. I don't see many small plot farming in the residential areas either. There is also the Walmart effect going on in this county, where many people, on fixed incomes, rely on Walmart as their single source for inexpensive food and goods. It almost seems like this area has forgotten self-reliance, and it is all about the Walmart to provide. The standard welfare food subsidy is $21 per week, or $3 per day. Even when Walmart undercuts others by $0.01 or more per item, it still is expensive to eat on food from Walmart only. There are a lot of people in Harlan County that live this way, and quite possibly feel stuck with no choice, but to shop at Walmart. Anyway, about Charlotte's, I ordered a breakfast plate for my lunch. That was a wise thing to do. 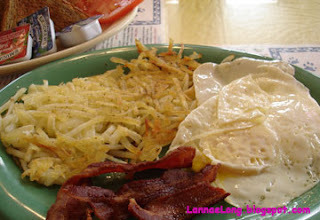 The hashbrowns are the kind I like, and if I were to cook them, I would leave them in the pan for a long time to get crispy. I got eggs over medium, bacon and wheat toast to go with the hashbrowns. My breakfast for lunch was good. While working in Harlan County, KY, there are a few chain fast food restaurants in town, but the real gems are the make-shift lunch counters to be found in all of the small towns that make up Harlan County. There is one such lunch counter in Wallins Creek, KY , a town that is only 1.01 sq kilometers. This tiny little town is only a few blocks long by 2 streets wide. This convenience store is rather non-discript, and I have passed by in a few times without even noticing it. Debbie runs the joint, and has set up 2 conference room tables in the back, and serves lunch to the locals. 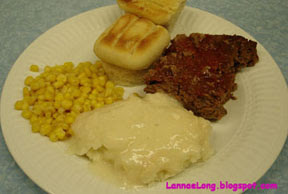 Debbie offered meatloaf with a ketchup sauce, corn, mashed potatoes, and rolls for lunch. This is so much more tasty than the McDs that is located in town. I also got to meet some local color, the neighbors who come and eat Debbie's lunch everyday. I also got to meet the health inspector who ate there too. I suspect that he would only eat in places that pass his inspection. 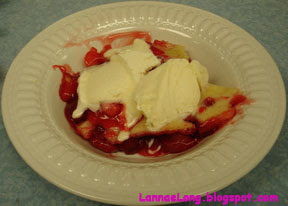 To finish off the meal, I had a bowl of cherry cobbler with vanilla ice cream on top. Can you get this at McD's? No I don' t think so. I suspect that in all the little towns up and down Harlan County, there lurks a tiny little lunch counter waiting for me to taste their creations. Until next time, I will be thinking about meatloaf for lunch. For what it is worth, I actually do travel to Kingdom Come and Back. Kingdom Come is in Harlan County, Kentucky, and I work up in Harlan County, Kentucky occasionally. Harlan is deep into coal country in Appalacia, and Harlan is definitely part of the south. At one time, with the coal boom, Harlan had some wealth, but with mechanical mining, loss of jobs, Harlan has fallen on hard times. 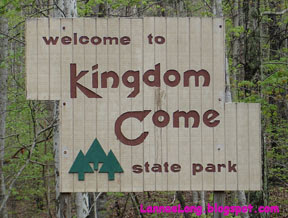 Kingdom Come State Park in Harlan is one place that is still thriving. Here is a look at the sign as you enter the park. 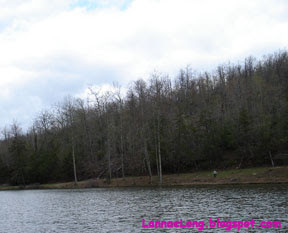 Here is the view of the hilltop lake of Kingdom Come State Park. It is amazing. We climbed a very steep winding road, and the we got to the top to see this lake. 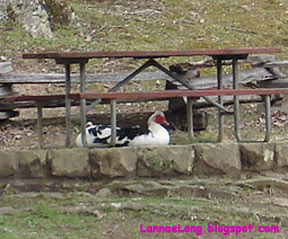 Here are some black and white ducks or geese sitting under the picnic table at the lunch area of the Kingdom Come State Park. These little critters had markings like a Jersey Cow. If you ever find yourself trying to find a shortcut between Tennessee and the north, and you are cutting through Harlan, Kingdom Come is worth going to and back. In a food processor or blender, add carrot tops, garlic, crushed red chili peppers and olive oil. Toss in a pan until heated and fragrant. Remove from heat, stir in fresh oregano, mint, cheese and crushed peanuts. Pinenuts, almonds, cashews etc would work, but I am a lazy cook, so the pre-crushed peanuts were way too easy and a no brainer. If it is too bitter, add a couple drops of honey. Toss on pasta, or freeze until ready to use. I was so excited to try it, and I made it for a potluck I went to. I had people guess what was in it, and everyone was surprised that there were carrot tops. The mistake I made was to add salt to the pesto before I added the cheese. The cheese is quite salty enough, so my taste testers had a bit of a shock of sodium. Note to self, when working with Romano, go easy on the salt! White's Creek Farmers Market just opened on June 2nd, and you got it, I was there! The farmers market is only open 8a-12p Saturdays on the southeast corner of White's Creek Pike and Old Hickory Blvd north of Nashville. White's Creek is about 10 miles as the crow flies from the center of Nashville, and about 14 miles on the road from me. It isn't a bad drive on Saturday morning. White's Creek is the most northern portion of my county, and it is amazing how rural it is and still is so close into Nashville. I am putting this into perspective, I drove only 14 road miles, stayed within my county, and found beautiful farmland. When I lived in Boston, I would have to go about 100 miles to west into the Bershire mountains for a sense of rural, or into New Hampshire and Vermont to the north (over 60 miles), and there is no sense of rural anywhere to the south of Boston until you get to Virginia (350+ miles) perhaps. Don't get me wrong, I do love Boston for so much of the other things it offers. It offers great public transportation, great learning institutions, great symphony, great ballet theatre, great colonial and revolutionary history, great chefs, great Chinatown, great coast line, great lobsters, and great culture. Oh yea, no tax on food, and most clothes. Back to the White's Creek Farmers Market. This is a group of 4 farms that are trying to give this market a go. Eaton's Creek, Sonfarm, Bramble Hill and Hungry Gnome Farm are the collective of farmers who seem to be friends and want to make things work. I think that it will work for me because it is about 3 miles closer to my house than the Franklin Farmer's Market, and on the way back to my home, I can drive right by the Nashville Farmer's Market where Freddie, from Mamushi Nature Farm, sells his chickens and eggs, and DW Farms are selling other meats. It will be about a 15 mile savings for me because I don't have to double back and pass my house like I used to, just to go get meat and eggs from Freddie and DW. With the way gasoline prices are going (still way cheaper than most of Europe), if I can save 1/2 gallon of gas (about $1.65) on a food shopping trip, each week, the savings over a years is $85.80 which can get me a 3-course dinner for 2 with a corkage fee for a bottle of wine at Margot Cafe, my favorite restaurant in Nashville. Look at my new potatoes I got from Hungry Gnome. 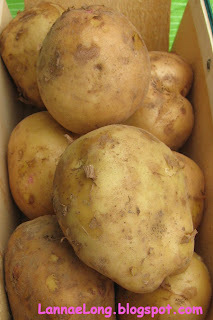 They are literally new potatoes that were the very 1st crop of potatoes from Hungry Gnome, and they were just picked that week for sale. I will fully admit that Hungry Gnome is my favorite direct source farm for me because of the food they offer, and for who these people are. Alicia Batson and Bert Hartman are both doctors, and partner in life with a vision of the way foods should be grown. I would like to have time with them and hear their story of how they got where they are. It is fun to hear Alicia say what is edible (all of it) of the food they are selling, and a suggestion for how to prepare the food. For example, in the winter, I was at the Harris Teeter grocery store buying beets. I asked the produce guy if I could eat the tops. He did not know, the book in the produce section said nothing about the beet greens, so I went home, cut them off and dumped the greens into my compost pile. Fast forward to spring and Hungry Gnome, Alicia casually mentioned that the beet greens could be cooked up just like chard, mustard greens, or other bitter greens. The outcome is that my compost pile is shrinking because I am not putting beet greens in the pile anymore, and I am now waiting for fall to get here so I can put tree leaves on it to compost over winter, so I can use the compost in my flower beds and herb pots. 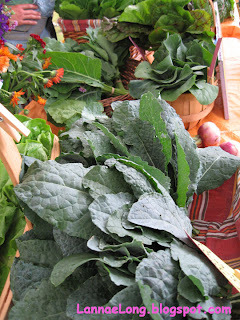 Here is a look at the Bramble Farm's greens. Aren't they pretty? About greens, I got a head of lettuce for only $2 from Hungry Gnome last week, and I have had some business travel and had not been able to eat it up. Since it was picked only 9 days ago, and has been handled very gently by Hungry Gnome and myself, I still have a vibrant head of lettuce without one black mark on it. I am sure it will last for a few more days, and I can have a decent salad today. What can you say about your lettuce in the pre-washed plastic bag? Those have a shelf life of less than 5 days, cost more, and there tends to be more waste. I prefer the cheap method of having a $2 head of lettuce last me for at least 2 weeks, if not more. I have a couple of back to back trips this week, so I did not buy a whole lot at the White's Creek Farmer's Market. 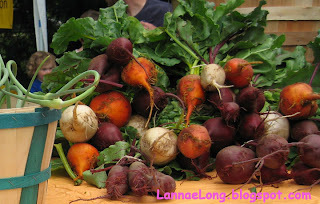 I did get some radishes to snack on, gorgeous garlic bulbs, and potatoes for later. I am so happy for new potatoes now because that means that the need for me to stray out to un-local brown rice and flour deminishes. I can do a lot with a potato. I really want to support this White's Creek Farmers Market. Why? Because the farmers have lovely displays of food on their tables, as you can see from my photos. How can you resist the beauty of the colors of the flowers and food in these photos, and for me in real life! I get giddy when I see the beautiful displays and colors, and the vision beckons me to buy and bring home some of that beauty for myself. This farmers market is closer to my house, and makes sense for road driving for other errands I need to run, so it will save me time in the long run. This weekend, I was able to go late to the market (9:30 am, and remember my household is late to bed, late to rise, and pass the coffee before doing anything), get home, unload, scamper off to do a full workout, run another errand and be home by 12:30 pm for lunch. This farmers market is fitting in great without compromising other aspects of my weekend life. I also really like Alicia and her preparation tips for parts of the food that are unusual, like carrot tops and beet tops. 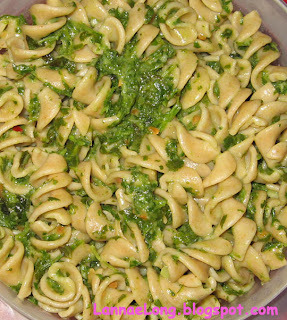 More to come on the carrot top pesto that wowed my friends at a potluck. Until then, bon apetit! The night before I started my trip into the Eat Locally experiment, I was so scared of giving up the complete opposite of local. I wanted to eat out for dinner, and the most opposite of Eating Local I could think of, without completely going fast food, was the Fifth Quarter off of Murfreesboro Rd and East Thompson Lane. The Fifth Quarter was born in the 1970s in Nashville, then 2 others opened in Charleston WV, and Louisville. The Fifth Quarter Steakhouse was built in a way to mimic the Brown Derby, sort of, but with wood paneling and vinyl instead of cherry wood and red leather. The concept of this 1970s restaurant is completely like the Steak and Ale, or other 1970s mid-range steakhouse accessible to the masses. Today, the Fifth Quarter has not really received any updating. The wood is worn, the tiled and carpeted floors have been walked on for 30 years. 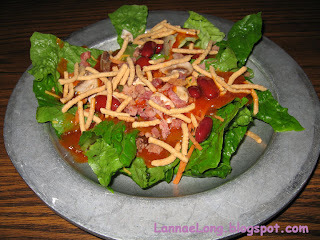 The salad bar still has a lot of canned fruit and chow mein noodles to put on refrigereated pewter plates. The rolling seats are worn 1970s cream colored vinyl. This place is a complete throwback to the 1970s. Everytime I go in to this place, I feel nostalgic for my childhood. When it was my birthday, my parents let me choose my birthday dinner. One year, in the 1970s, I picked the Brown Derby. For whatever it is worth, the Fifth Quarter takes me back to that time. What I also remember from the 1970s, as a child in Southern California, is that it was the 1st time I heard about globalization of food. I remember going to lunch at a little soup and salad place in Brentwood, CA (aka the home of O. J. Simpson) and they had a fresh artichoke salad all year long. My mom was in awe, and said that she did not realize artichokes were in season. The cafe owner said they they import the artichokes, so they were able to serve this delicious dish all year long. Isn't it funny how now California is not leading the Eat Locally movement, after leading the globalization of food movement back in the 1970s. Anyway, back to present time, I doubt that the Fifth Quarter has one local source supplier, and most of the food is probably canned and provided by some food service like Sysco, the leading food distributor in Nashville. I am sure that there has not been one local strawberry, or one fresh peach in this place. The lettuce has to be from far away lands. The beef, probably from the industrial slaughterhouse in Colorado, as written about in Fast Food Nation. This is as far opposite as I could think of for anti-local eating, while still having a decently prepared meal with tasty food. The salad bar at this place is so old school, and completely 1970s. They still use pewter plates, which I hate the feeling of forks rubbing against the pewter. I usually ask for a regular plate, but this time I went "all in" with the pewter. The salad bar has canned fruits, canned olives, canned beans, creamy potato salad, pasta salad, cubes of cheese, sunflower seeds, industrial bacon bits, and iceburg and romaine lettuce. Most of the dressings are the old school ranch, blue cheese, thousand island and a cesear to go with the "make your own cesear salad" section of the salad bar. Here is my main entree. 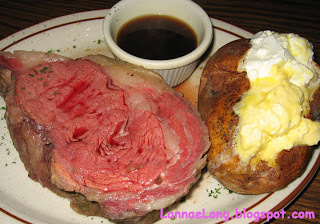 I got a very rare prime rib plate with a baked potato with extra hydrogenated oil compound (they called it butter, but I think it was whipped margerine) and sour cream. The reality is that the Fifth Quarter does make a good prime rib, and probably one of the best in town. I have gone to a few other steak places in town, and the Fifth Quarter is the tastiest. The service is all very Nashville. There always seems to be earnest college aged servers who are very friendly in a Nashville kind of way, and they are in the uniform that was probably 1st agreed upon by the owners during the 1st day they were opened. I ate my meal, relishing each bite. I was thinking that I would have to give up beef, sour cream, potatoes and the 50 item salad bar. I was certain I would miss the beef and salad bar. Little did I know, there is a local beef supplier that sells at the Franklin Farmer's Market, and there are plenty of tasty veggies grown locally for me and I do not miss the crazy salad bar toppings. What is in store with my frequenting the Fifth Quarter? I probably will again. They are the only place in town that does serve a really rare Prime Rib. I mean, cold and red in the middle, not pink and medium done, I mean nearly mooing. I probably won't go there again this year, but 2008, when I want to get that 1970's feeling again, I will go back.